Autumn dawns have a very special appeal. It needs some luck to catch the small time window where the light is not too strong and washed out by the usual haze but just bright enough to enlighten the scene in a warm manner which, in my region, can only be seen during fall. Wow. This is just breathtaking. I’m loving all of your autumn photos. Stunning image, superb and beautiful. Really like the soft light and the warm fall colors. Excellent work, Uwe! Terrific. You have a real knack for fall colors. A beautiful series. Absolut fantastisch. Das warme sanfte Licht ist wunderschön. Wie schafts Du es immer solch eine tolle Stimmung in die Fotos zu Zaubern? Beautiful. Such a lovely warm, calm image. It’s refreshing just to look at it. Breathtakingly beautiful color and light. 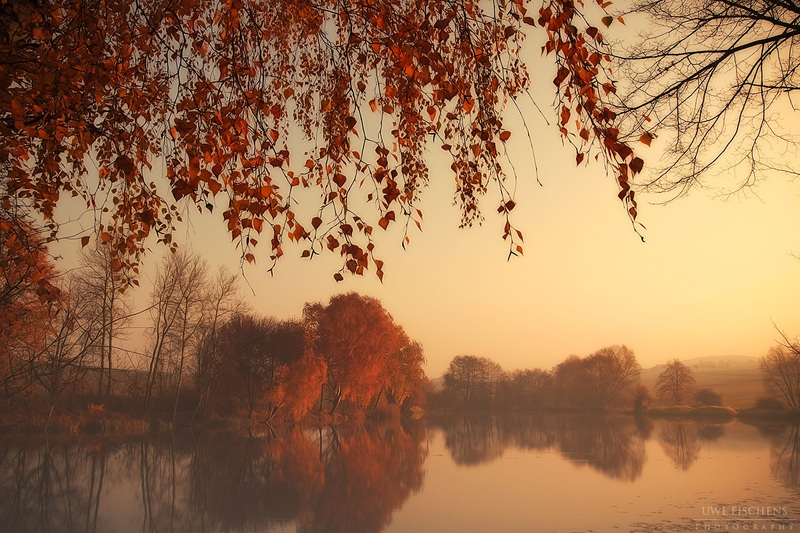 Gorgeous autumn scene and image! Splendid shot–I love the soft light and superb framing. Amazing work! This is incredibly beautiful. I love the lighting and the feel of emotion this photo invokes. Amazing job! those shots make photography an art. thanks for sharing with us.